You know I really couldn’t have picked a better time for sharing these cookies than this week. The weather suddenly went from warm Spring to a springy Christmas. It snowed like crazy yesterday and the trees broke under the heaviness of the new, wet snow. Despite some rays of sunshine today, it is still pretty cold. It’s what I describe as “see your own breath” kind of cold. That’s my “thermometer”. And I was so excited to break in a fresh new pair of Chucks, now I have to wait. Clearly, cookies and cold weather go together like a charm. 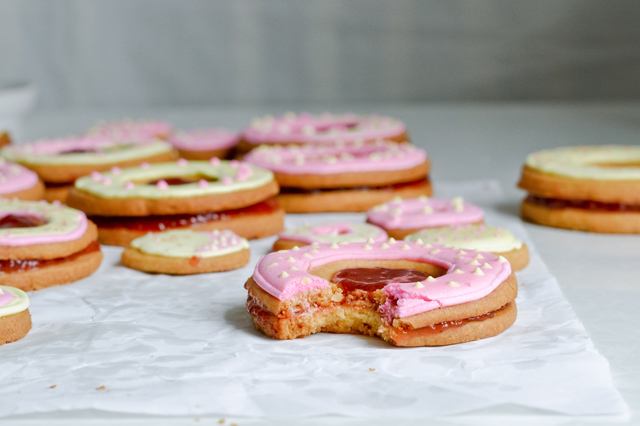 But pretty pastel pink and yellow cookies are even more fitting for dark, grumpy days. As with cakes, I don’t have one favorite cookie. I do have a list of my favorite ones and then choose them depending on mood. On that list are the mushroom cookies (walnut or strawberry), which are very festive and great for the winter holidays; the ricotta peach cookies, which are perfect for a summer party; chocolate chip cookies, that are the ultimate comfort cookies; plain sugar or shortbread cookies, which are perfect for dipping and then there are the linzer cookies. I absolutely adore linzer cookies. I think they work for any occasion or moment and are especially satisfying as an afternoon snack. 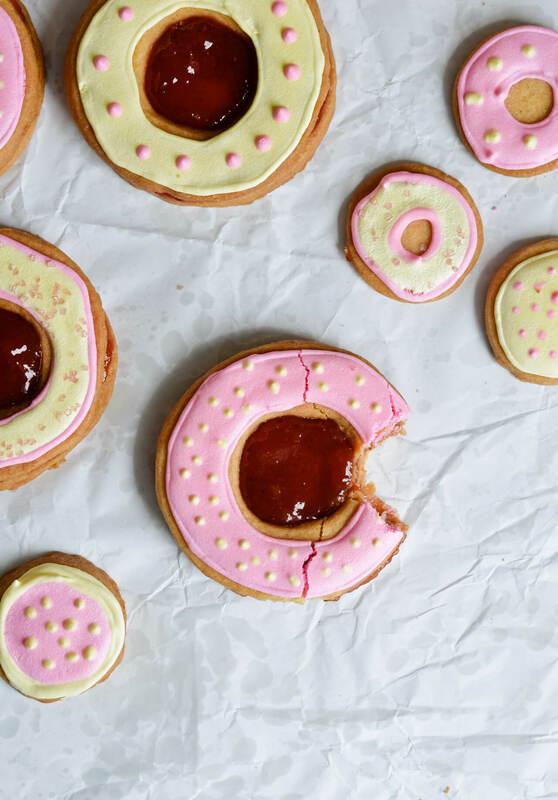 The cookie, the jam and sugar on top… oooh my. And they’re pretty too! But in honor of reaching a 1000 followers on Instagram I wanted to get a bit creative in the kitchen and make a combo cookie. A conscious coupling (ha!) of a shortbread cookie, linzer cookie and a decorated cookie. 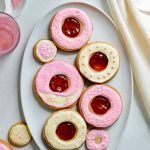 Enter these strawberry shortbread sandwich cookies that look like pretty doughnuts and are the size of an average doughnut too! I love big cookies, the kind where you only need one to satisfy that sugar / cookie crave. Not that I don’t like small cookies, because believe me I do, but there’s just something so special about one big cookie. It almost looks like a prize, doesn’t it? These cookies are buttery and soft, flavored with a touch of vanilla. 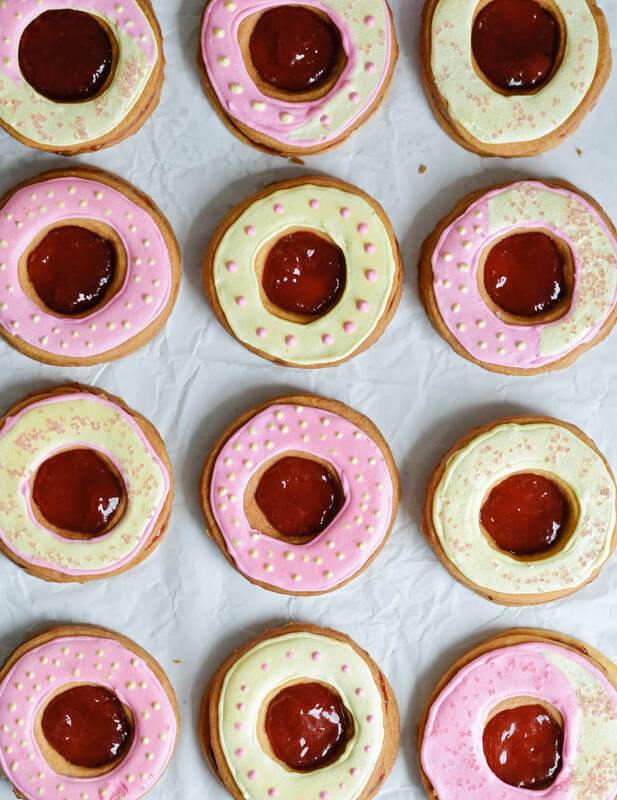 The strawberry jam that looks like a ruby peaking through makes them perfectly moist and aromatic. And the icing isn’t only decorative, it substitutes the powdered sugar on a classic linzer cookie and is the cherry on top with its sweetness. 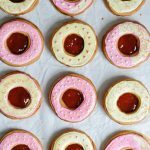 Perfect combo cookies, that combine the buttery shortbreads with delicious jam. In a medium bowl whisk together flour and salt, set aside. 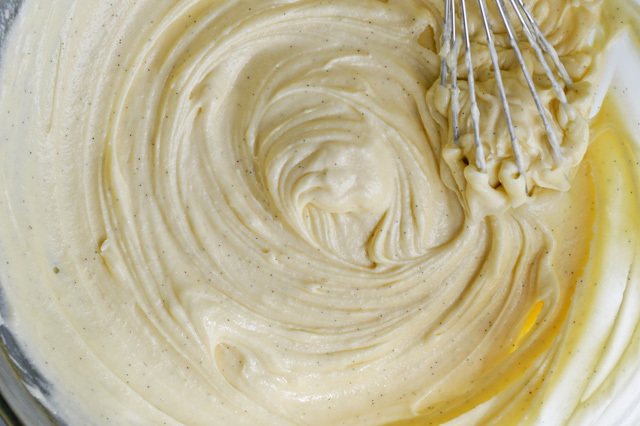 In another bowl, or bowl of your mixer, beat the butter until smooth and creamy (if doing by hand, cream it with a spatula first, then beat with a whisk), for about 1 minute. Add sugar and whisk until smooth, lastly stir in the vanilla bean paste. Gently stir in the flour mixture until incorporated. Split dough into 3-4 portions, flatten each into a disk, wrap in plastic wrap and chill in the fridge until the dough is firm, for about an hour or more. Preheat oven to 180°C (350°F), with the rack in the middle of the oven. Line two baking sheets with parchment paper and set aside. Take 2 disks out of the fridge and let them sit at room temperature for a few minutes. Lightly flour your work surface and roll out the dough about 6mm (1/4 inch) thick. 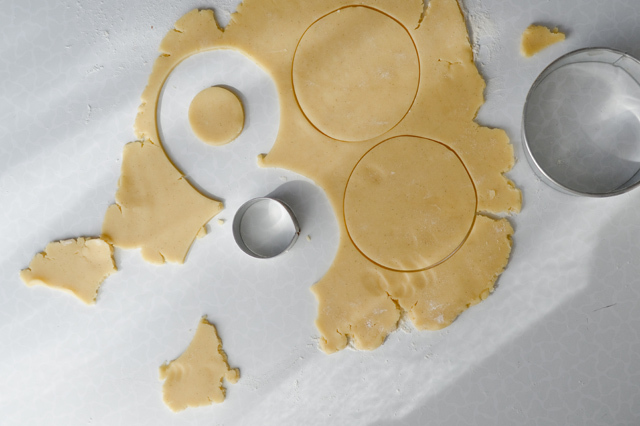 Dip cookie cutters into flour then cut out large circles. From 1/2 of these, cut out smaller circles. 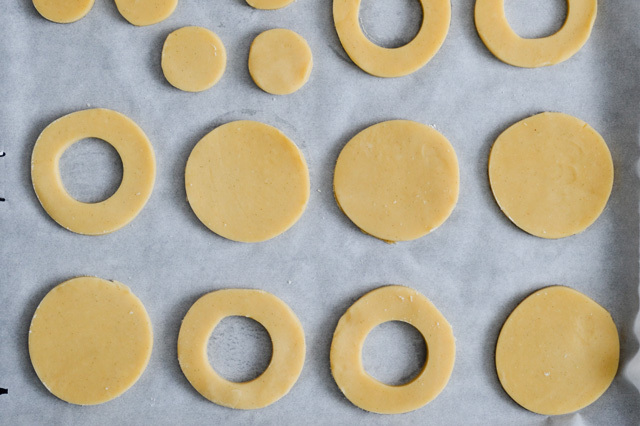 Place cookies on prepared baking sheets and put in the fridge for about 15 minutes or until the cookies are firm again. Bake for 8-10 minutes, until cookies are lightly browned. Remove from oven, leave cookies on the sheet for about 3-5 minutes, then carefully remove them from the baking sheet and transfer to large plates. At this point you can let the cookies cool completely, then store them in an airtight container and decorate the next day. Or let them cool, as you make the royal icing for decorating. 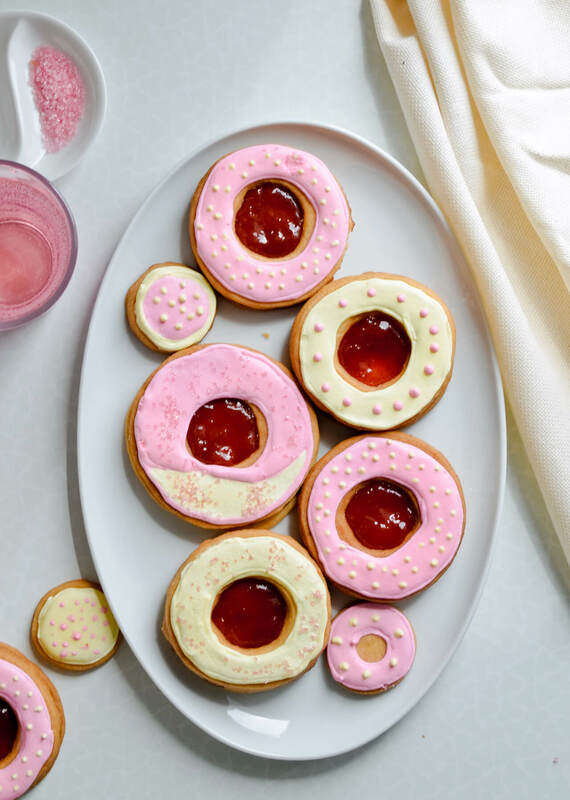 Alternately, you can skip the royal icing and assemble the cookies without it, then simply sprinkle with powdered sugar (like linzer cookies). 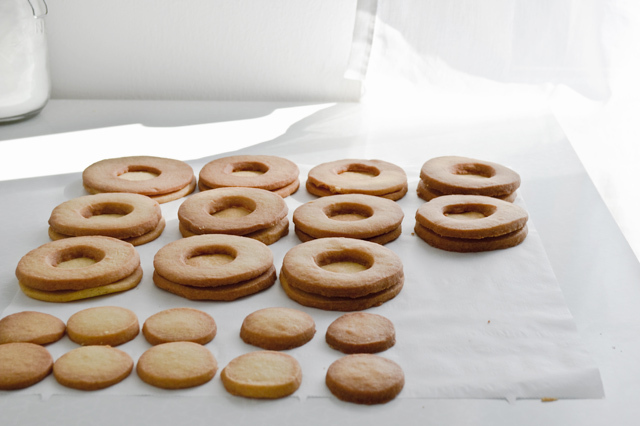 Recipe for shortbreads adapted from Joy of Baking. Recipe makes about 2 1/2 cups of royal icing. In the bowl of your electric mixer, whisk together the powdered sugar and meringue powder. With the speed on low, slowly add 1/2 cup of water. The mixture might look a bit lumpy and thick. Keep adding water, if necessary, and mixing until the mixture is thick but smooth, like honey. Beat the mixture on medium speed for about 3-4 minutes, until the icing is fluffy and thick and stop as it forms stiff peaks. 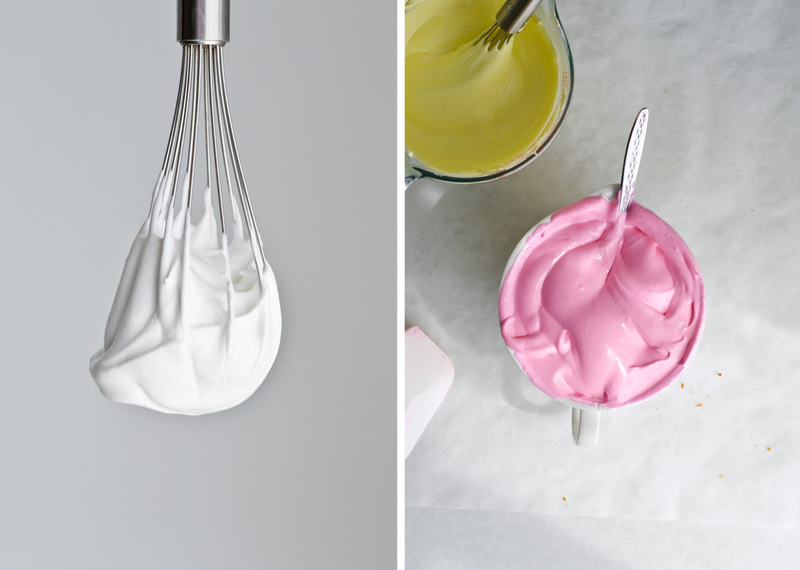 If you dip a whisk into the icing, the icing should stay on the whisk and not fall down immediately. 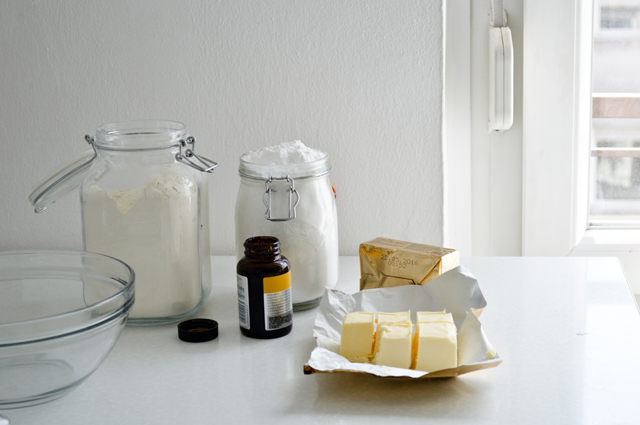 Divide icing into two small mixing bowls or jugs (somethinglike Pyrex measuring cups). Add a few drops of food coloring to each one and whisk until the icing is evenly colored. 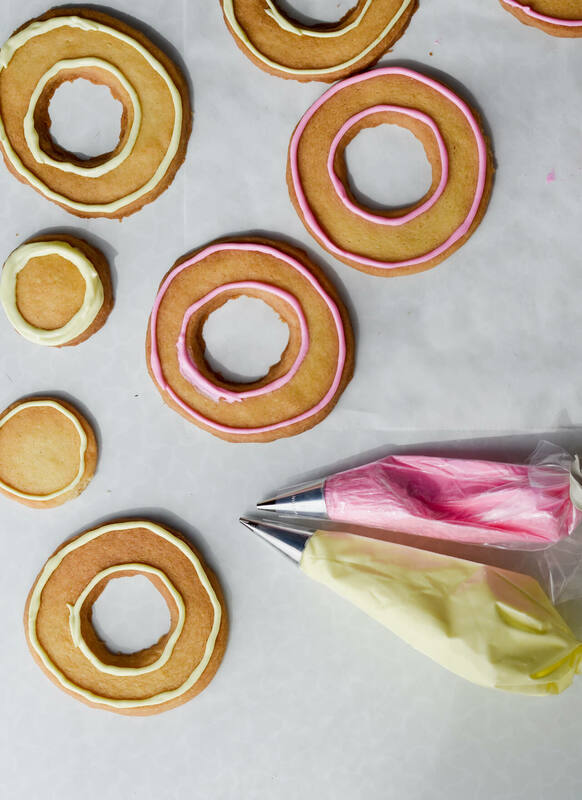 To prepare the icing for piping add a drop of water to each, then whisk it in. Keep adding water until the icing is a tad less thick, similar to toothpaste. Spoon some icing of each color into two pastry or disposable bags, fitted with a small round tip (I used size 4). Twist bags at the end, pushing icing towards the tip. Outline the cookies. If you want a cookie of 2 colors, also make the dividing lines within the borders. Add a few drops of water to each of the bowls with icing and stir until incorporated. 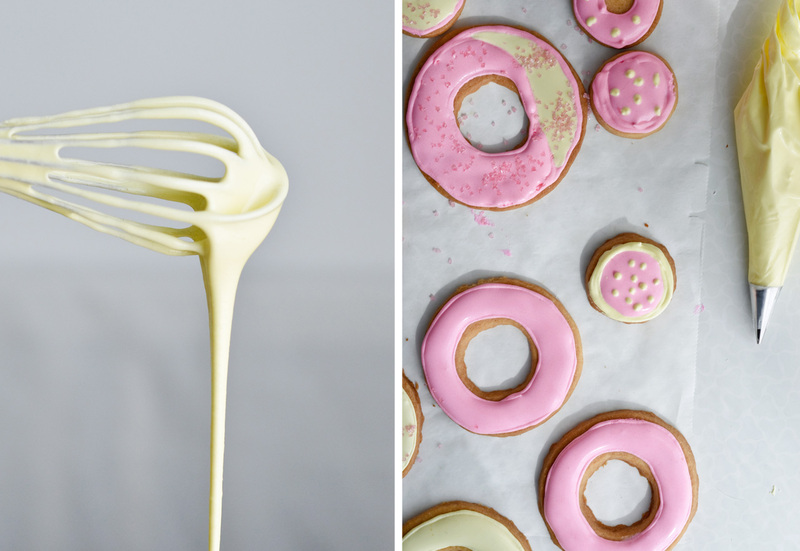 You want the icing to be easily spreadable, but still somewhat thick, similar to honey. Because of the shape of these cookies, it is best if you transfer the icing to small plastic bottles, which make flooding very easy. Flood the cookies, I made about 1/2 pink and the other yellow. Push icing towards the edge with a toothpick. When all the cookies are flooded let them set for about 5 minutes, then sprinkle with sprinkles or make small dots with the icing leftover in the bags you used for outlining. 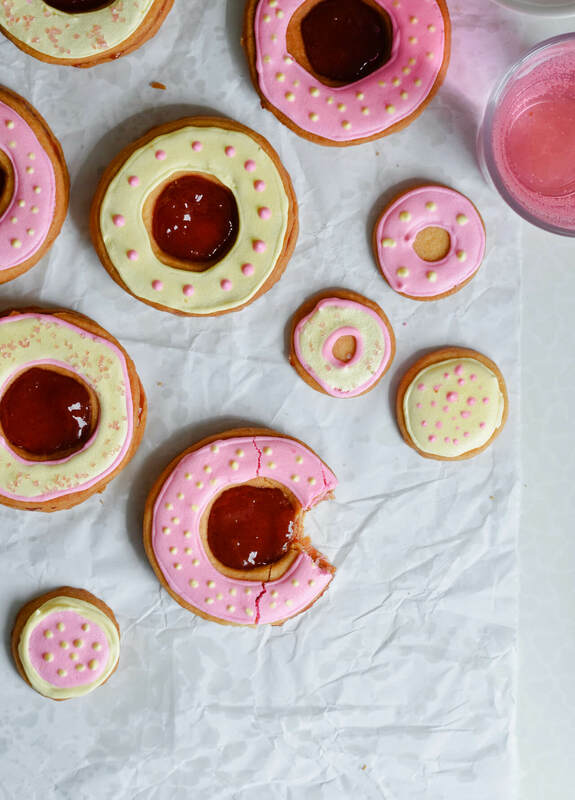 Let cookies dry completely before adding the jam, for a few hours or even overnight. 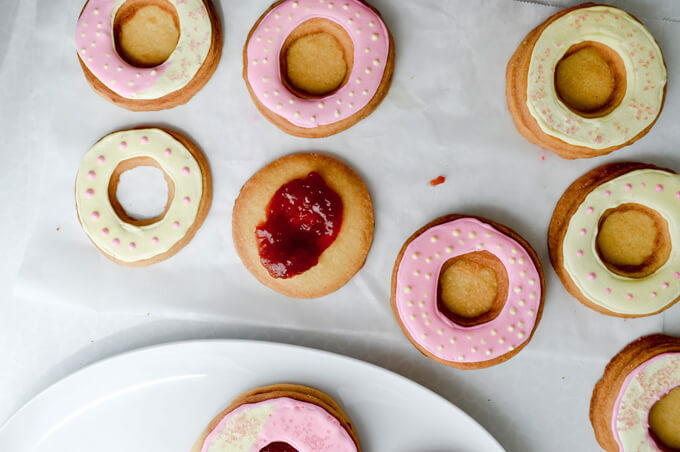 Spread 1-2 tablespoons of jam over each “bottom” cookie, but don’t let it reach the edge. 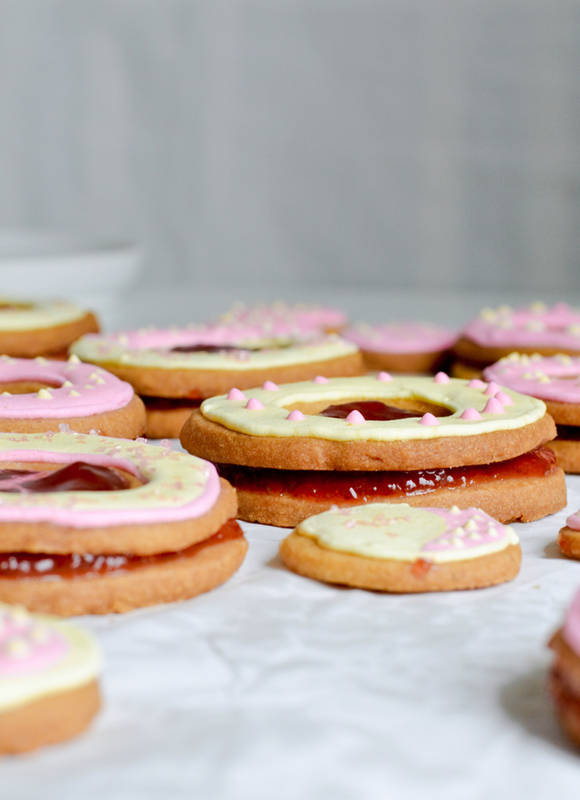 Add the top “doughnut” cookie and gently press it down, this will push the jam towards the outer edge. If any jam is dripping over, wipe it away. Do this with all the cookies, then arrange them on a platter and cover with plastic wrap. Store at room temperature. Royal icing recipe adapted from Sweet Sugarbelle, which also has a ton of useful tips! Definitely worth checking out.